In as much as everyone of us loves free things, I would also advice we take care and mind the way we go about it. I have noticed that quite a number of people tend to carelessly connect to whatsoever free public WiFi that comes their way without even minding the source or checking for security vulnerabilities before connecting. 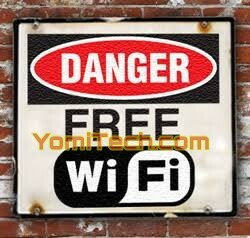 In today's article, I would be pointing out the dangers of using free public WiFi networks, also I would point out few tips on the disadvantages of using these networks and also few ways to protect yourself. Hey! If your still reading , which I guess you are, I would suggest you get a comfy chair , probably a glass of water, sit tight and continue reading. Let's look at the dangers of using free public WiFi networks. I don't know if you have probably heard of a tool called wireshark, this tool can be used to snif emails and so many other things you do online. √ Credentials eg work ID , BVN also get stolen. So be warned or you'd end up like Mr k who at the end of the week got a call from bank manager B that he did a heavy transaction of 9million in a day, shocking! Mr k almost fainted but remembered he used the free WiFi network in a coffee shop to do a transaction of just 1million. Above story was just a simple illustration, I would suggest you get back to it, read again and understand. How do I protect myself when using public WiFi. Whenever you go to a coffee shop or a hotel with Free WiFi, I would suggest you use a WiFi protector before connecting because using incognito mode alone won't do you any good. Recently in one of my articles on 5 tips on how to stay safe when using public WiFi I listed some ways to stay safe and am going to list few here. Another way is to use up to date antivirus, because antivirus detect fake and dubious connections. Another way is putting on firewall for your PC. This helps a lot especially on PC running Windows operating system. I believe that with the few I have listed , you are now aware of the dangers and how to play safe , don't forget to share to friends, it might be useful and probably they would buy you a drink someday. My name is Chibuike Udochi, am an engineering student, a techie and also a tech blogger who loves anything tech and keeps on spreading the gospel of tech. I own and run www.tipsrush.com.